The difference between contact lens exams and standard eye exams mainly involves eye doctors measuring the shape of your cornea and the overall surface of your eye. In addition, your Fremont optometrists may recommend certain types of contact lenses according to your occupation, lifestyle and other factors involving eye health. After testing your vision to determine the degree and type of refractive error you have, your optometrist will use a keratometer to measure your cornea's dimensions. Keratometers provide accurate measurements of your eye's surface curvature by evaluating how light reflects off your cornea. Another instrument called a biomicroscope allows your Fremont optometrists to closely inspect your eye's surface and aids in the development of properly fitting contact lenses. Corneal topography testing further examines your eye by creating a detailed surface map consisting of variously colored contours for identifying possible aberrations such as corneal surface irregularities known to cause astigmatism. People with astigmatism often need to wear toric contact lens especially shaped to eliminate the visual distortion and blurriness of astigmatism. Other contact lens exam tests may include iris and pupil measurements and tear film evaluation to determine if you have dry eye syndrome. All tests performed by your eye doctor are necessary to create contact lenses that fit properly and accommodate your vision and eye health needs. If you have an active lifestyle, you don't have to worry about your glasses falling off, breaking or getting lost. With daily disposable contact lenses, you don't have to worry about keeping eyeglass lenses clean. Just pop in a fresh pair of disposable contacts in the morning and toss them at night! As a contact lens wearer additional tests are done for you that are necessary to make sure your eyes are healthy, that your lenses fit properly and to ensure that you are seeing as well as possible. Contact lens professional fees are for the extra testing and time taken by the staff and doctor each year to properly evaluate your contact lenses. What types of additional tests are needed? The first test uses the microscope to examine the fit of What types of the contact lens and the health of the cornea. Second, prescription measurements are done which are different than those for glasses. Third, the doctors remove the lenses and place dye in the eye to determine the health of the cornea underneath the contact lens. Fourth, the doctors discuss your use of solutions and recommend any changes, to improve comfort and reduce red, irritated eyes. in addition, they may order a corneal topography reading to further monitor any undesirable changes of the cornea. Isn't this part of my annual eye exam? These contact lens-related tests are done in addition to the eye examination. These are procedures that only need to be done for contact lens wearers, not for patients who don't wear contact lenses. Does my insurance cover contact lens professional fees? It depends on your plan's coverage. Most insurance plans cover a routine eye exam which determines your glasses prescription and evaluates your eye health. Contact lens services are separate procedures that often are not covered by insurance. Professional fees vary with the time and complexity of your contact lenses. They start at $70.60. If we need to refit you with another type of contact lens there will be additional charges above your lens annual fee. What Kind of Contacts Lenses are Available from My Fremont Optometrists? Made using pliable plastics called silicone hydrogels that permit oxygen to reach the cornea, soft contact lenses are the most popular type of contacts because they are comfortable and easy to adjust to. RPG lenses are durable, resistant to eye deposit build up and easier to handle than soft contacts due to a reduced risk of tearing. Typically made from silicone hydrogel, extended wear contacts can be worn overnight, several nights in a row or for up to one month before throwing them away. Your Fremont optometrists typically prescribe spherical lenses to treat nearsightedness, farsightedness and presbyopia. Cylindrically shaped toric contacts rely on your eyelids interacting with gravity to correct abnormalities in the shape of the cornea. They are prescribed to correct astigmatism. 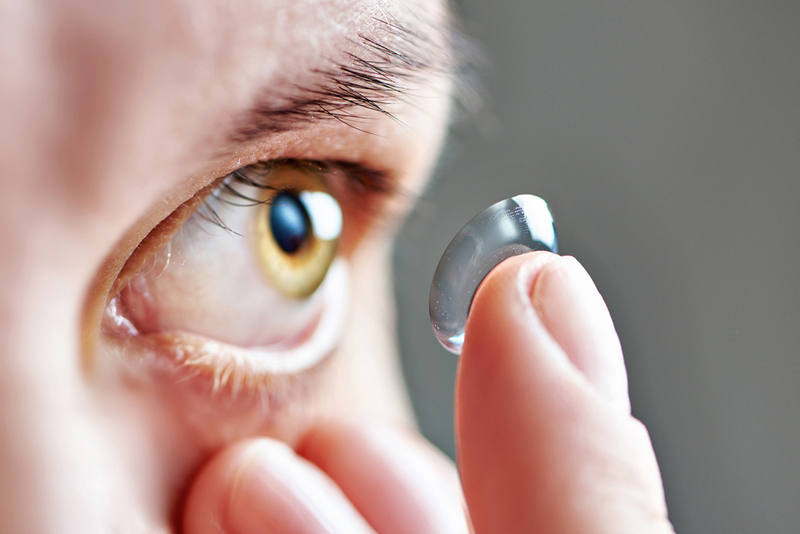 If you have been diagnosed with presbyopia, your eye doctors may prescribe one of these types of contact lenses. To schedule a contact lens exam with Fremont optometrists, please call the Warm Springs Optometric Group today at (510) 490-0287.